Sydney is a population centre and former city in Nova Scotia, Canada. Kick off your visit on the 19th (Wed): kick back and relax at Black Brook Beach. 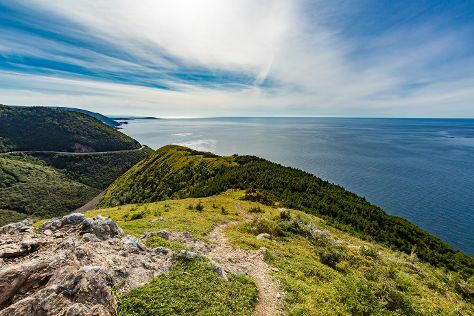 Get ready for a full day of sightseeing on the next day: explore the activities along Bras d'Or Lake and then hike along Cabot Trail. To find other places to visit, traveler tips, photos, and more tourist information, read our Sydney travel planner. Toronto to Sydney is an approximately 4-hour flight. You can also drive; or do a combination of train and bus. The time zone difference moving from Eastern Standard Time to Atlantic Standard Time is 1 hour. Plan for little chillier temperatures traveling from Toronto in July, with highs in Sydney at 27°C and lows at 15°C. Finish your sightseeing early on the 21st (Fri) so you can drive to Ingonish. Kick off your visit on the 21st (Fri): explore the wealth of natural beauty at Cape Breton Highlands National Park. Get ready for a full day of sightseeing on the 22nd (Sat): experience rural life at Groovy Goat Farm & Soap Company, kick back and relax at Ingonish Beach, and then trek along Middle Head Trail. To find other places to visit, ratings, traveler tips, and other tourist information, use the Ingonish vacation trip planner. Traveling by car from Sydney to Ingonish takes 2.5 hours. July in Ingonish sees daily highs of 27°C and lows of 15°C at night. Finish your sightseeing early on the 22nd (Sat) to allow enough time to travel back home.